These are lyrics by Liz Phair that we think are kind of repetitive. 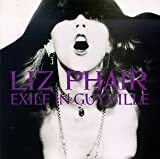 Liz Phair's, "Why Can't I?" The answer is...I dunno! So stop asking! You probably just have a crush on the guy, ok?